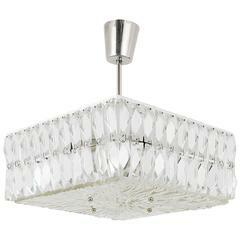 Precious faceted crystal glass Art Deco chandelier. 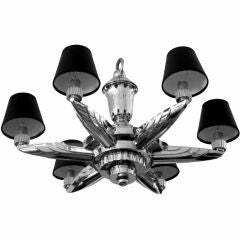 The beautiful chandelier takes six E14 standard screw bulbs to illuminate. The wiring is very good so it is in fine working order and ready to use. The total length is about 70 cm, and it has a width of 52 cm. Cleaned with love this chandelier stays in a very good original vintage condition. Due to the delicate crystal glass and age there be some minor nicks to one glass(see last two pictures). It presents beautifully. Typical for first class Italian lighting, this lamp is made with best materials and is of very high quality. This sparkling beauty is an eye-catcher. It would be a perfect addition and upgrade for any Mid-Century Modern or noble stylish interior. Measures: Height fixture is 52 cm. Diameter is 52 cm. 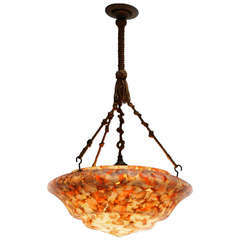 Art Deco opaline glass chandelier. Diameter 40 cm. Total height: 60 cm. Art deco chandelier. Diameter:80 cm. Height:68 cm. Six bulbs with bajonetfitting B22. 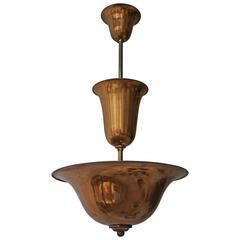 Art Deco copper chandelier. Measures: Diameter 45 cm. Height 85 cm. 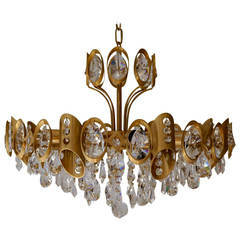 Absolutely gorgeous Palwa brass gilt and crystal chandelier. Measure: Total height 100 cm. This light has eight E14 bulbs. 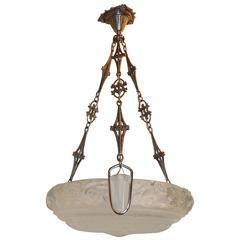 Fantastic French Art Deco Chandelier made by Petitot, nickel-plated bronze and brass, six lights.